Sometime during the night of 15th/16th December 1485 Queen Isabella I of Castile gave birth to a daughter, Catalina, at Alcalá de Henares, near Madrid. Catalina was the last child of Isabella and her husband Ferdinand II of Aragón and was named after her maternal great-grandmother, Catalina of Castile or Catherine of Lancaster. Of course, we know Princess Catalina better as Catherine of Aragon, first wife of Henry VIII. Did an Eating Disorder Prevent Catherine of Aragon having a Son? Catherine’s namesake, Catherine of Lancaster was the daughter of John of Gaunt by his 2nd wife, Constanza of Castille. People often forget that Catherine of Aragon had Plantagenet blood in her. She was also descended from Phillipa of Lancaster, John of Gaunt’s daughter by his 1st wife, Blanche of Lancaster; Phillipa became Queen Consort of Portugal and was Catherine’s great-great-grandmother. This made her Prince Arthur and Henry VIII’s 2nd cousin twice removed and 3rd cousin once removed, twice over – via the Tudor descent from John of Gaunt’s legitmized son, John Beaufort, Duke of Somerset; and again via their descent from John of Gaunt’s legitimized daughter, Joan Beaufort, Countess of Westmoreland. They are also more distantly related through John of Gaunt’s elder brother, Lionel of Antwerp, Duke of Clarence. The genealogy of the children of Edward III gets complicated quickly! But it may be that Catherine actually had more Plantagenet blood than the Tudors did when you get down to it. Certainly more than Henry VII had. 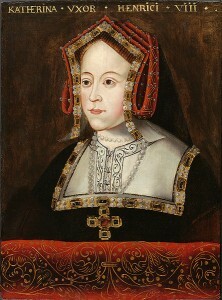 Catherine of Aragon also had Plantagenet blood by a daughter of Eleanor of Aquitaine and Henry II, Eleanor of England, Queen consort of Castile as wife of Alfonso VIII. Happy birthday, Catherine! I can’t help wondering if some of Henry’s ill treatment of Catherine was due to her having an independent claim to the throne that was better than Henry VII If, like Chapuys, you wish to credit Richard III”s claim that the children of Edward IV were illegitimate, then her claim was better than that of Henry VIII. Katherine was almost born on horseback as her mother Isabella was on active campaign against the Islamic invaders of Spain. I think that she inherited her mother’s fiercesome nature and courage. Even Henry was worried that Katherine could command an army and oust him. The descendents of Blanche of Castile and John of Gaunt certainly had a good claim to the throne; but I doubt that was the root of Henry’s mistreatment of her. Henry and Katherine were both as stubborn as each other and a perfect match. Katherine rightly refused to allow Henry to disinherit their daughter and as a mother fought for her rights and those of Mary. It is not surprising that after 20 plus years of marriage that she was not just going to surrender. Henry used her refusal to budge, (quite literally) or to climb down to withhold her rights from her and to keep their daughter from her. He was afraid Katherine would gain support from Mary and that they would both move against him. He was also attempting to get Katherine to accept that she was no longer queen. There is no justification for the way he treated Katherine or Mary; but that is how Henry saw things. But of course none of this could be seen on the day of her birth and Isabella must have had glittering hopes for her yoingest daughter just as she did for her other children. Yesterday I was watching the rerun of The Tuders and I realised something that I didn’t like at all.in that series they picture Catherine as a weak women who is always begging Henry to take her back.I don’t think she was like that she was a queen and she was Isabella of Castile’s daughter so she would never beg Henry. I have to say Anna, I never perceived her as weak in The Tudors. In fact, she is strong, stubborn and doesn’t back down from her claim till her last breath. She begs Henry because he is her husband, and sovereign King. By rule of God, she had to obey him. She was strong in her faith, and subsequently, obedience of her king and lord. She also loved him dearly, and believed her marriage was valid. She did everything she could to save her marriage, a promise before God. Also, even the strongest people have moments of weakness, desperation, and sadness. This does not mean she was not a strong person, just that she was human like the rest of us who could feel humiliated, alone, and heart-broken. Actually we don’t really know what Katherine of Aragon would of done in The Tudor times though i would love to know what she was really like back in the 1500s. Hello Margaret, I think there is a reasonable case for Henry having a medical problem which affected his production of healthy children, because although there was a high probability of babies dying young in those days, the rate with Henry seems extraordinary. However, there is also discussion on if either Anne or Katherine had problems, because they had only one healthy girl and there is a condition to explain this that affects their blood and is known today. Although Katherine came from a large family, they did have sporadic fertility problems and even the Plantagenet line of York lost several children young or in their teens. It is something that cannot be proven, but later in his life Henry did suffer from periods of impotency, which given his growing weight problems and declining health and he was on wife no three when he was forty six, is not unexpected or unusual, but it was difficult in an age when male masculine prowess was a big deal. There is no evidence beyond the vicious remark of Anne to her sister in law, that Henry had any problems before 1537. Katherine and Anne were regularly pregnant, even if the result was not positive. Other women may or may not have had his children, but he only recognised one boy, but he was not that promiscuous. If he had a medical problem, it lay elsewhere, not in his fertility or that of his wives. There is no evidence of any venerial disease either, due to the fact we would know if he received mercury for six weeks, so this cannot explain any later sterile periods. His depression and injuries and obesity did certainly contribute to later problems. I have to respectfully disagree about Jane Seymour. Had she lived and her son lived, which he did until the end of Henry’s reign, she would have been his Queen until the end of his life. While it may be true he may have been bored after a time, a Royal wife is not there to entertain her husband, he has other women for that and we don’t have enough information to form any real assessment of Jane. There is no evidence that she was boring and she took part in the entertainment at court and loved to hunt, so why is she consistently called boring, when there is no contemporary evidence to support it? She may have upset him trying to reform everything, but then as the mother of the heir, she could have asked for anything. Even if Jane didn’t give him and more children, she was safe as the mother of his heir. If he wanted other women he could have them, Jane was still safe and we have no evidence that he would have married again, unless she died. His later marriage adventures are because Jane died and he didn’t ckick with wife no four, whom he married almost three years after Jane’s death as nobody would say yes. I also believe Jane would have had a bigger role as Queen Mother than Katherine Parr did and it is entirely possible that she would have had more children. This is the problem with history, too many questions unanswered but the speculation makes it interesting.